AT&amp;T's traveling distracted driving campaign, "It Can Wait", stopped in the valley today. AT&T's traveling distracted driving campaign, "It Can Wait" , stopped in the valley today. 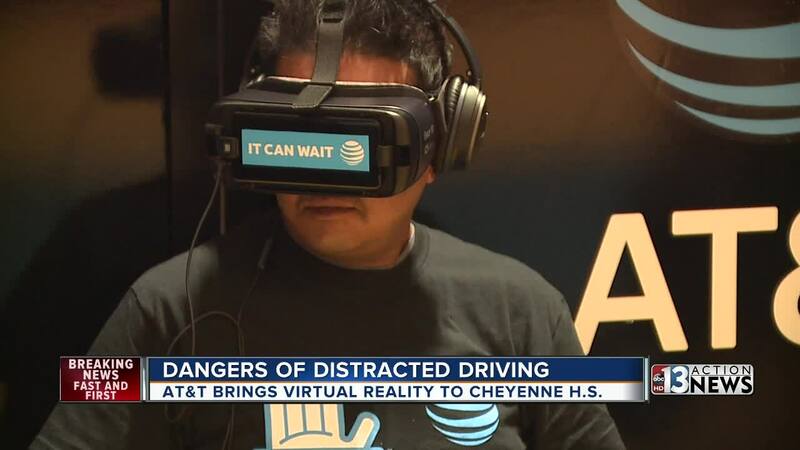 They brought their 3-D virtual reality presentation to Cheyenne High School to have new drivers see the dangers of distracted driving. According to the campaign, nine out of 10 people admit to using their smartphone behind the wheel. Nearly a quarter of them don't see it as a major problem. 81% say they text while driving. 64% say they take photos and videos while driving. 60% say they send emails while driving. "We had a few tears," said Chris Johnson, AT&T spokesperson for "It Can Wait" campaign. "Students walked away with tears in their eyes saying hey this is not worth my whole life. Not only am I going to pledge to never do it, but I'm going to tell my parents to keep their eyes on the road too." Jenifer Watkins thinks the campaign is a good idea. She and her husband were hit by a distracted driver in 2004 when they pulled over on U.S. 95 near Tropicana to help their friend whose car was broken down. "People can't tell by looking at my but I had to learn how to walk, talk, you name it all over again," said Watkins. The distracted driver was a 17-year-old girl who admitted to being on her phone and fiddling with the radio. Watkins spent seven weeks in the hospital with life threatening injuries. "It wasn't my time to go," she said. "I know I'm still here for a reason and I thank God every day that I'm still here because I'm here for a purpose. I don't know what it is yet but He knows." Watkins wants everyone to realize the dangers to distracted driving. "It only takes a second then lives are changed," she said. "You don't want to live with that consequence the rest of your life knowing that you hurt somebody that wasn't doing anything wrong because you were just being stupid talking on your phone."